Help our children play on their field! 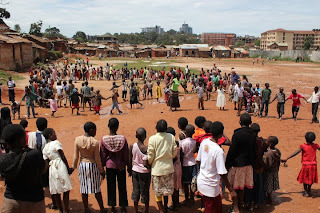 Children in Katanga love to play games, and it is these children which inspired us to start Kids Club Kampala in the first place, to bring hope and love to these children and to allow them to just be kids and to have fun in a safe environment. In yesterday’s blog post, I talked about how our fantastic volunteers spent a day cleaning up Katanga slum . 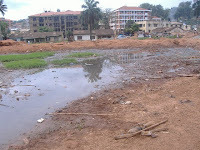 However, after poor management, large amounts of soil being dumped in the field and weeks of flooding following the rains in Kampala, the field in the middle of the slum is a mess! 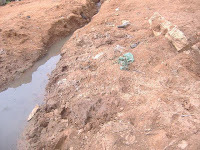 The field is completely unusable – the ground is uneven, it is dirty, it is muddy, it is full of rubbish and not only extremely dangerous but also very unhygienic due to pools of stagnant dirty water in the field which become breeding grounds for malaria and typhoid. The field in Katanga is central to what we do at this centre – it is where we hold our Kids Club activities, it is where our children play games and sing songs, it is where our football teams train and have matches, it is where our music and dance groups practise, and so much more. 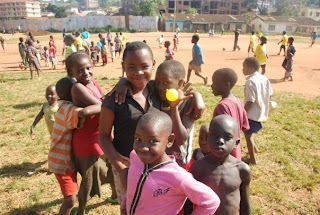 Life is tough enough in Katanga and the field provided a welcome break for children to play and have fun in. 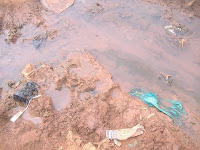 Our children no longer have a safe environment to play in and this is heart-breaking. Children enjoying playing on the field before it got ruined. 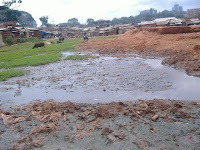 The community in Katanga are very concerned about this and have come to Kids Club Kampala to ask if we can help them to sort out the field so their children can attend KCK activities. We love this community and want to honour their request and help them to sort out the field. 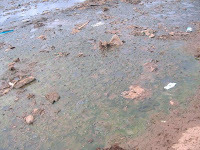 The best solution for the field is to hire a tractor and some people to dig to sort out the field and level it, and to put some protection around the edge of the field so that the stream doesn't flood it when it rains. This will cost approximately 5 million Ugandan Shillings, which is about £1250. We are hoping to raise this money as soon as possible, as it is a priority that our children are kept safe and have somewhere to play and be kids. We are asking for your help in this – please help us to share the word and if you would like to donate to this cause, please get in touch. 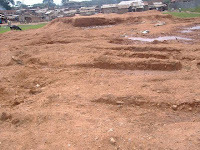 Help us to restore the field! Newer PostVital Donations for the children - thank you!